New Jersey Devils. Buy it and wear this Devils jersey/shirt with pride! "DEVILS" is printed on the front and outlined in a shiny reflective silver. The team logo is printed below "DEVILS". "Eye-catching" rhinestones above and below "DEVILS" adds extra fashion flair to this shirt. New Jersey Devils. White w/ Red Sleeves - 100% Cotton. New Jersey Devils Jay Pandolfo Women's Reebok Jersey MEASUREMENTS SIZE-Women's XL Pit to Pit- 23 Neck to Bottom-25. Make Supersized Seem Small. This item is 100% authentic - BUY IT NOW. This is a New (SEE PHOTOS). Get Images that. This is 100% authentic - BUY NOW. Just choose how fast you want it. This is a NEW. You are purchasing the exact shirt pictured. Materials: 100% Cotton. Unpaid item cases will close automatically and will not be extended. Design: Kickoff - Soft Shell Jacket. Team: New Jersey Devils. Primary team color body bonded to grey hooded softshell full zip jacket. Storm cuff with thumbhole at sleeve cuff. It is for inventory purposes only. Just choose how fast you want it. This is 100% authentic - BUY NOW. New Jersey Devils. Length 23". Armpit to armpit (22"). Color: Black. This item is 100% authentic - BUY IT NOW. This is a New (SEE PHOTOS). Team: New Jersey Devils Brand: G-III Size: Medium Gender: Womens Item: Screened Intentionally Distressed T-shirt Material: 100% Cotton Condition: New with Tags. Team: New Jersey Devils Brand: Reebok Gender: Women Size: Large Product: Jersey Shirt with Screen Printed Graphics/Logo, Rivets on Collar and Sewn On Jock Tag Material: 100% Polyester Condition: New with Tags ~ Please note that there are red marks along the right side. Thank you. This is a lightly used women’s large New Jersey Devils hooded sweatshirt that is in very good condition. It is made to look slightly worn. See pictures for more details. If you have any questions please feel free to contact me. Thank you and be sure to take a look at my other listings! Design: Recovery Hoody. Team: New Jersey Devils. Team: New Jersey Devils Brand: Touch by Alyssa Milano Size: Large Gender: Womens Item: Screened Full Zip Hooded Sweatshirt Material: 50% Polyester 38% Cotton 12% Rayon Condition: New without Tags. 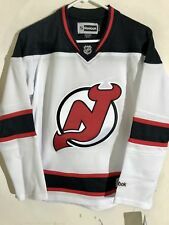 Team: New Jersey Devils Brand: G-III 4her Size: Medium Gender: Womens Item: Screened Full Zip Hooded Sweatshirt Material: 92% Polyester 8% Spandex Condition: New without Tags **Sample: This item was a sales sample**. Make Supersized seem small. This item is 100% authentic - BUY IT NOW. This is a New (SEE PHOTOS).